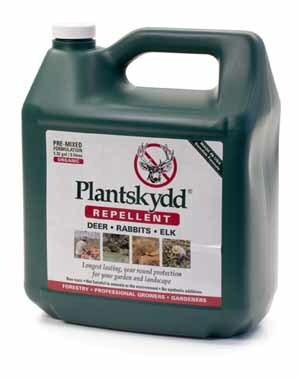 Proven successful for repelling deer, elk and rabbits for up to 6 months. Environment friendly Plantskydd was developed in Sweden in 1991 and was extensively tested in Canada before being considered for regeneration projects in the United States. It has since been accepted as a viable option for animal damage protection. 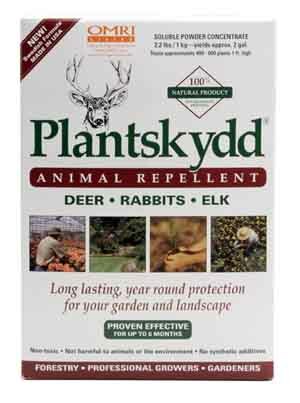 Plantskydd gives off an odor that deer, elk and other foraging animals associate with predator activity. Seedlings treated with Plantskydd during dormancy or after planting will remain protected from winter browse for 3-6 months, even in rain or snow. It is recommended that trees be re-treated after bud break. 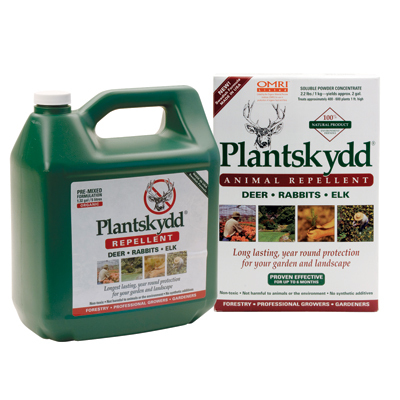 Plantskydd comes in a powder form and is mixed with water for dipping seedlings prior to planting, spraying after planting or at bud break. 2.2 lbs. of powder mixed with 1 1/2 gallons of water will dip treat 700-800 conifer seedlings or 400-600 as a spray on.